Vijay celebrates his 42nd Birthday today on Monday June 22. His upcoming movie Puli first look and official Teaser have been released back-to-back, now he is being wished by celebrities and his fans across the world. While coming to his celebrations Vijay is holidaying with his family in London but not in India, It is the good day for his fans every year. Fans are planning something different. Apart from cutting the cake and distributing sweets, they are indulging in social welfare activities. The fan’s club Vijay are organising blood donation camps, distributing books and other articles for economically weaker sections. Every year, the actor indulges in social work on his birthday. The actor is lovingly called Ilaya Thalapathy (meaning: Young leader) by his fans. As a birthday gift to Vijay and his fans, the makers of his upcoming film Puli wanted to release the first teaser of the film on Monday. But due to growing demand from Vijay fans, they decided to release it a day early. 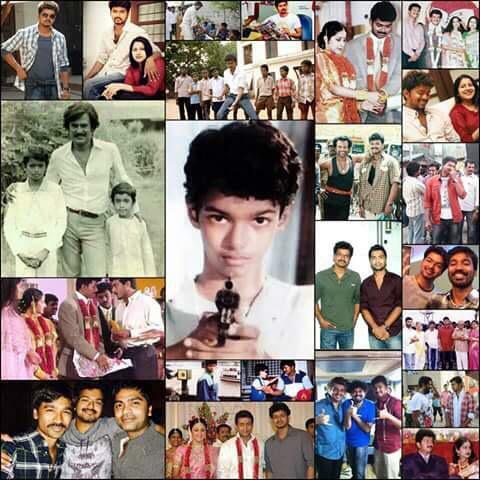 Vijay debuted into the Tamil Film Industry as a child artist in the film titled ‘Vetri’. Later, he made his debut as a main actor with the film ‘Naalaya Theerpu’ in 1992. With ‘Poove Unakkaga’ (1996), Vijay tasted the first commercial hit in his career and it made him a recognizable star. He never turned back after then. Vijay co-starred with Vijaykanth in ‘Sendhoorapandi’. In the morning Twitter was trending with the #HBDDearVijay hashtag, with fans posting pictures and memes of the star. Wishing you health, happiness and greater success with Puli!! The man with dancing feet. Happy birthday #ilayathalapathy vijay .. Happy bday to the one and only @actorvijay , puli teaser was rocking. Happiest Musical Bday to our dear ILAYATHALAPATHY @actorvijay !!! Wishing U all Success always sir !!! Happy bday ilayathalabathy vijay Anna ! Luv u the most!